Next week (the 23th and the 24th of May), we will be in Strasbourg to participate to ELRIGfr event, where we will present two posters. 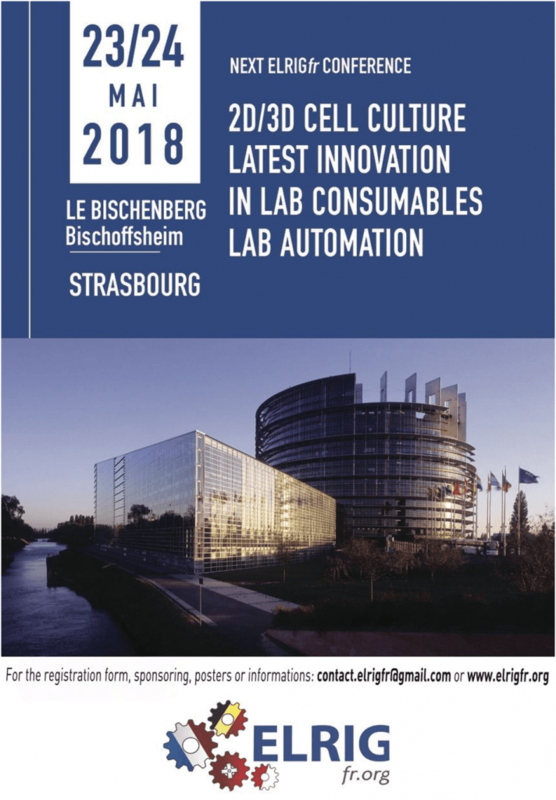 The first poster is about BIOMIMESYS® hydroscaffold for 3D cell culture and the compatibility with automation; the plates can be seeded, treated easily using the VIAFLO 96/384. Cells were imaged using our ImageXpress® Micro Confocal High-Content Imaging System (Molecular Devices). The second poster is about Neurotoxicity assessment and the comparison between SH-SY5Y and iPSC-derived neuronal cells. We will discuss the sensitivity of iPSC-derived neuronal cells compared to the sensitivity of SH-SY5Y cell line. Toxic effects were then measured by HCS cell imaging. Don’t miss the presentation of Karim Si Tayeb in the oral session about 3D innovative hiPSC-based models including the microenvironment for phenotypic screening, and their applications on metabolic diseases. If you want to meet Elodie (Study director), Meryl (PhD student) or Zied (Senior scientist) you can use the networking tool of the event (Lab Social’Club) or just contact us! See you soon in Strasbourg!